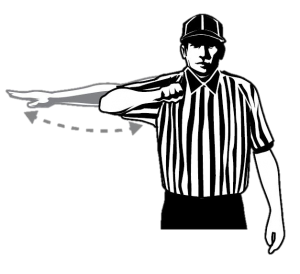 Some of the most difficult NFHS rules and mechanics for newer officials to master are the three counts involved in advancing the ball: the four second goalie count (Rule 4-19 and 20 Art. 5, the 20-second clearing count (Rules 4-13) and the 10-second count (Rule 4-14). While the basic requirements and mechanics for each are fairly straightforward, the challenge emerges when an official is tasked in game situations with BOTH recognizing and communicating when each count begins and ends. You gotta have the count! Mastering the rules and mechanics of counts takes time in the rules book, practice and game experience. Study, practice, watch games and game film. Work through situations in your head and talk them out with fellow officials. The time and hard work that you put into truly understanding and properly administering this aspect of the game will elevate you to the next level of your officiating career! It is ESSENTIAL that you have a working timer if you are doing games U-15 and above. 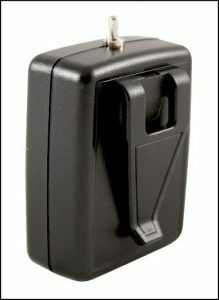 Be sure to check to see if your timer works before you go out on the field and carry a small screwdriver and extra batteries with you in your bag. If you do not have a working timer, let you partner know so that you can come up with a way to address the situation. Often times, veteran officials will have an extra timer. If you do not have an extra timer, you will need to keep the count in your head. All counts begin with a player being in possession of the ball. Player possession (Rule 4-5 Art 2.) is defined as the ability of a player to cradle, carry pass or shoot the ball. Before initiating ANY count, be CERTAIN that the player is actually in possession. Often the level of play will influence what you determine to be possession. At the youth level, players should actively demonstrate one of the four actions. At higher levels of play, a bit more leeway can be given. Once a player gains possession in their defensive end, the Lead becomes the new Trail and is responsible for BOTH the the 20-second clearing and the four-second goalie counts. As soon as possession is gained, the new Trail raises his hand and gives the twirl signalling a change of possession and switches on his timer. This is NOT a verbal count and it is NOT a visual count. The clearing team can carry, pass or kick the ball ON or OVER the midfield line. The ball can be in player possession or loose. The new Trail should raise his arm and give the “Reset” signal by twirling a finger and then turn his timer on. If the buzzer goes off and the the ball has not crossed midfield, whistle the play dead and award the ball to the opposing team. If the ball crosses midfield in time, simply switch your timer off. You MUST have a 20-second timer to work U13 games and higher. Under no circumstances should an official use his watch or give a visual. The Trail will, most likely, be well behind the play and not in position to to determine whether of not the midfield line has been crossed . The Lead MUST signal to the Trail by raising his arm. If the play has gone on for a while, the Lead can also verbalize “He’s over!” to be sure the Trail ends the count before his timer buzzes. Once the requirements of gaining the attack area are met, both officials should signal by raising an arm and then pointing to the box. As the Trail comes up the field on a clear, he may need to determine if a count is in progress and assist his partner. Often times the Lead may not have a good view of the play especially if it is on the far side of the field. However, the Lead, may be screened by players, the goal, the field may be crowned, or the lines may be difficult to make out. If the Trail is unsure his partner sees that the count has ended it is good practice to also verbalize to your partner that a player in possession or a loose ball have touched inside the attack area by yelling “He’s in!” to be sure your partner ends the count. Counts are an essential part of the game and mastering the count rules and mechanics is key. An important consequence of ending a 10-count is that Over and Back is now in play. Once possession has been gained AND the initial 10-count has been satisfied. Therefore it is important for all officials to communicate each and every time the count ends (Rule 4:14). If a team fails to satisfy these requirements within 20 seconds, they have committed a technical foul, failure to advance, and you have two options: whistle the play dead or treat it as a play on situation. If the team clearing the ball is in possession and fails to clear the ball in twenty seconds, whistle the play dead, signal failure to advance and award the ball to the opposing team. Quick restart. If the ball is loose, you can treat it as a play on. 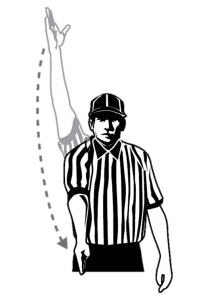 If the opposing team is about to gain possession of the ball, you can raise your hand to signal and verbalize “Play On.” If the opposing team gains possession, the Play On is over, if not whistle the play dead, award the ball to the opposing team and initiate a quick restart. If the goalie gains possession IN THE CREASE, he is allowed four seconds before the ball must leave the crease. The goalie is considered in the crease as long as ANY part of his body is touching the crease (Rule 4-18 Art. 5). The goalie will gain possession in one of three ways: saving a shot, intercepting or receiving a pass or picking up a loose ball. The four-second count ALWAYS happen in conjunction with a 20-second count. If the goalie is the first defensive player to gain possession, the four second count begins simultaneously with the 20-second count. If the defense has already gained possession and a 20 second count has been started, the four second count is concurrent with the 20-second count. If the keeper makes a save and unintentionally drops the ball in the crease, start a new four-second count while the 20-second count continues uninterrupted. If the keeper leaves the crease and then inadvertently kicks the ball back into the crease, start a new four-second count. The keeper may not deliberately drop the ball and attempt to get a new four-second count. chanic by saying to yourself “One Mississippi” with each swing. Many newer officials get excited and count much to quickly. The goalie gets four seconds, so be sure to give him four seconds. If the goalie in possession has not left the crease (i.e. no part of his body in contact with the crease) or the ball has not left the goalie’s possession and is outside the crease when you END your count, that is you have completed the fourth swing of the arm, blow the whistle and signal a crease violation. Award the ball to the opposing team in the alley. If there is no violation, simply stop counting and drop your arm to your side. If the Goalie is the first defensive player to gain possession in his defensive end you must initiate a 20-second count AND a four-second count AT THE SAME TIME. 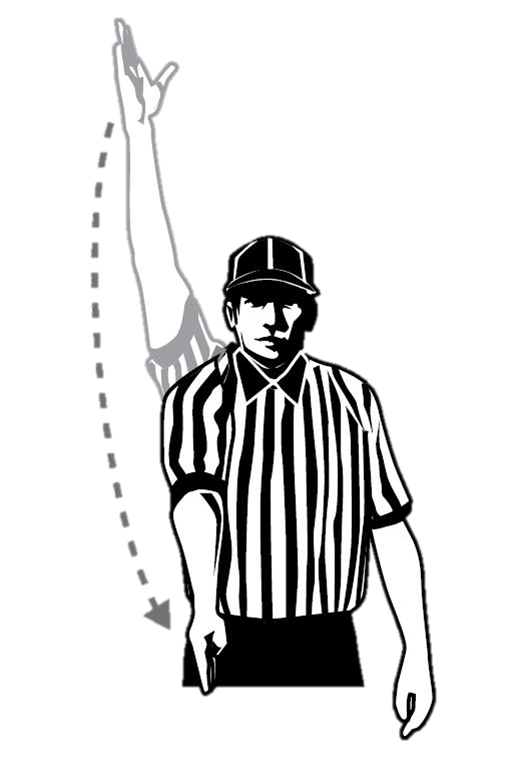 The Trail should raise his arm and give the “Reset” signal signifying a change of possession by twirling a finger and then reach down and turn his timer on. He should then begin to chop out the four-second count BUT start this count at two (2). The rationale for this is that the pump and flip mechanic has accounted for the second the goalie is allowed in the crease. 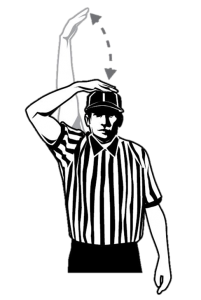 A whistle by the official will stop play and will either end or reset the count. This can be for the ball going out of bounds, whistle ending a Play On for a loose ball technical, to administer a time serving foul, a time out, or an inadvertent whistle. A time serving foul will result in a free clear, so there is no need for a 20-second count and a 10 count will begin on the whistle. If the ball is awarded to the Riding team in their offensive end, they will begin play with ten seconds to gain the attack area. A Play On or FDSW resets a 10 or 20 count! 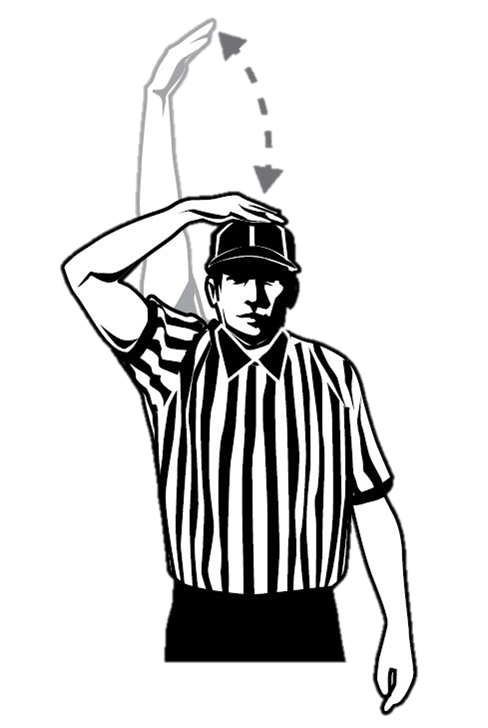 In three man games, the single side official has all 10 and 20-counts and the Trail is responsible for the 4-second count. It is imperative that the crew communicate that a change of possession has occurred by giving the twirl. If you are unclear that your single knows a count has started you may want to verbalize by yelling “Reset!